The American Concrete Pavement Association (ACPA) has created a number of on-line resources for concrete pavement engineers, contractors, suppliers and other pratcioners, enabling ready access to useful applications and current technical publications, reports, presentations, and references. As a chapter of ACPA, the Indiana Chapter ACPA is licensed to provide “members and customers” access to over 1000 concrete pavement related technical references published by ACPA, FHWA, IPRF, (Innovative Pavement Research Foundation), IGGA (International Grooving and Grinding Association), CP Tech Center (National Concrete Pavement Technology Center), and other industry groups. Any agency representative or consulting engineer engaged in the design, construction, maintenance, or management of pavement may obtain access to this comprehensive library by contacting us (or any other ACPA associated state organization). In Indiana, send an e-mail to Pat Long and you will receive guest login credentials. 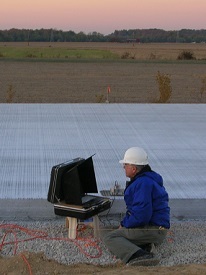 Then, visit ACPA’s Concrete Pavement Resource Center to login as a guest of the Indiana Chapter. At ACPA’s online application library, you’ll find a collection of web- and desktop-based applications created to assist you in the design, construction, and analysis of concrete pavements. Visit the Application Library and explore a number of useful applications. Another on-line resource is a searchable data base of various concrete overlays across the U.S.
Visit the National Concrete Overlay Explorer to search over 1100 concrete overlays built for local and state systems across the U.S.